Field of Battle by Brent Oman is one of my favorite wargames rules sets of all time. With the release of the second edition expected in July, I thought it would be useful to post a review of the 1st edition (green text) that I did a year or so ago (also posted on Mark Severin's site), followed by a listing of my own House Rules for FoB 1st edition Napoleonic games (brown text), followed by a description of many of the changes in the second edition (blue text, with my comments in purple) so you can skip to whatever section(s) interest you. In most cases, the changes to the second edition of FoB are more a matter of clarification and/or fine tuning the rules, rather than wholesale revisions. The description of the 2nd edition changes is based on the draft of December 2010, and reviewed with the permission of the author. They may well have been (and probably were) at least some minor changes made since that draft. This is an extremely active and helpful group. There is a FAQ for Field of Battle, a scenario for Eylau 1807 (by yours truly), several versions of the Quick Reference Sheet available for down load, and more. 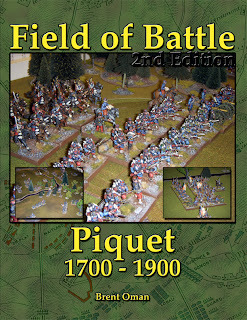 PRICE (with date): $30.00 (in 2010) * Note that the Piquet Master Rules are NOT needed or used with Field of Battle. 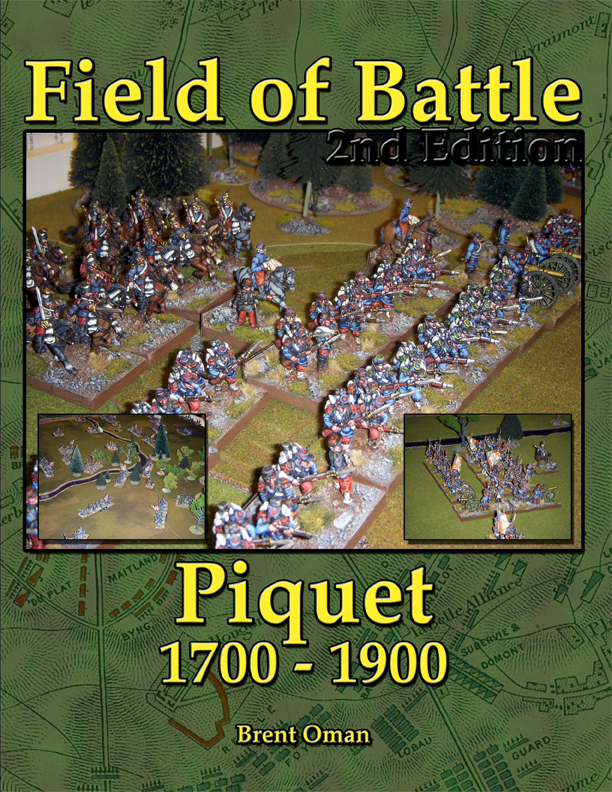 REVIEWED BY: Peter “Gonsalvo” Anderson – While I had nothing to do with the development of Field of Battle aside from providing the figures for and participating in the big playtest game held at Historicon in 2005, I have written 2 rules sets for Piquet (Band of Brothers, 2nd edition; Hostile Realms), and a scenario book for the 1809 Campaign using these rules. PERIOD COVERED: 1700 – 1900 A.D.
Field of Battle is a full size ( 8.5” x 11”), 100 page bound rule book with full color cover and black and white interior. Separate playsheets ( 2 pages only) are included (plain paper – I suggest printing out one of the online files for these ( especially the color version that I did!) on to cardstock), or placing them back to back in a sheet protector (which is what I do). These rules require a deck of Sequence Cards for each army. Very basic, utilitarian versions are provided on plain cardstock (which must be cut out). These are certainly adequate to play the game, but are unlovely. A much nicer set of standard sized color cards are now available from Piquet. In addition, I have designed my own full color cards for Field of Battle (with the standard of the relevant nation on the backs of the cards) that print out onto Avery Business card stock using a home inkjet printer. Typically a player will control 2 to 5 Command groups, with roughly 8 to 25 units, say about 100 – 200 figures depending upon basing. Four stand units of Infantry represent about a battalion of 480 – 720 men, four stand units of Cavalry represent regiments of 400 – 600 men, and 2 stand units of Artillery represent 6 – 8 guns with crew. (I have scaled these up to as much as three times these ratios, i.e. 1 infantry unit = regiment of about 2000 men, etc., and it has worked fine). Time scale: 1 turn = variable amount of time, from 30 minutes to 2 - 3 hours. Figure/Base Ratio: roughly 1 figure = 50 men; For 25mm figures, 3 - 4 Infantry, 2 Cavalry, and 3 - 4 crew plus a gun per stand are suggested, but again this has no effect on play whatsoever. Recommended Figure size: 25/28mm, but not really important; players have used 6mm to 40mm. Table Size: I have used these rules on tables as small as 5 x 6 feet, and up to 24 feet or more. Basing is not terribly critical to the play of Field of Battle. Provided both sides are based the same, the important part of basing is frontage. Infantry, cavalry and artillery stands should all have the same (or close to it) frontage, roughly 1.5 to 2”. Field of Battle uses a Sequence Deck to govern the actions that your troops may take. Each side has their own deck, with the composition being determined by the quality of that Army's Commander in Chief. Each deck generally contains three cards each for Move, Artillery Firepower, Infantry Firepower, Melee, and Army Morale, plus 2 Tactical Advantage, 3-4 Move, 1-2 Move One Command, 1-2 Maneuver, 2 – 5 Leadership, and 1-6 Lull cards. The better decks have more good cards and fewer Lull cards. All decks have 27 cards. There are another 11 kinds of special/optional cards that can be used to represent special events, characteristics, etc. ; my favorite is the “Sneaky Heathens” card, used in Colonial type games to allow the Natives a surprise move interrupting the European player's actions. The key concept is that, aside from firing “loaded” units, the player can only do what they have the card showing for. Each side doesn't just turn the cards in turn. Each side's commander rolls a Leadership die, ranging from a D8 (eight sided die, numbered 1-8) to a D12+1. The high roller gets to chose whether he will act first or second, but unlike standard Piquet, BOTH sides get the full difference in pips as "impetus" to spend. Each impetus turns a new card, and allows ALL the units of that side to act on that card, if able. When duplicate Leadership die rolls occur, OR one side goes through their entire deck a turn is completed. Thus the flow of events is quite unpredictable, with a marked tendency to ebb and flow! At the same time, the “balanced impetus” means the game is less “unfair” than standard Piquet, and the fact that all units can act on the cards as they are turned keeps everyone in the action – most of the time, anyway! Movement: In Field of Battle, the player's units are organized into Command Groups, which would typically represent a Brigade or Division. A command Group typically contains 2 to 6 units, but there is no absolute upper limit, and some might have a single unit. Each command group has a Leader (general), and each Leader has a Leadership Die determined randomly but influenced heavily by the army he belongs to (for example, French Leaders in 1805 will, on average, be much better ( have higher Leadership Die types) than Austrian ones, but by 1813 the difference is much less pronounced). When a MOVE card is turned, ALL the Command Group leaders on that side roll their Leadership die against D6 (six sided die) rolls by their opponent. If the Leadership die roll is a “1”, then units of that command group may NOT move on that card. Otherwise, ALL the units in the Command Group will get 1, 2,, or 3 segments of movement depending upon how they scored against the D6 roll. A segment is 8” for Infantry and Foot Artillery, 12” for Cavalry and Horse Artillery. On “Even” Leadership Die rolls, special things are allowed, such as changing facing or formation, resolving melees immediately for attack columns, and cavalry, and so on. Fire Combat: Infantry and Artillery units may “fire” (asses the effects of fire combat up to that point) at any time, but once they do so, they are marked with a “puff of smoke”, and may not do so again until the appropriate kind of Firepower card is turned by their side, at which point smoke markers are removed. Each unit has a Combat Die type ranging from a D8 to a D12+1, and a Defense Die type ranging from a D4 to D10. Higher die types are better. To resolve fire combat, the unit modifies its Combat die type up or down (hierarchy: D4 – D6 – D8 – D10 – D12 – D12+1 – D12 +2, etc) based upon a limited number of straightforward modifiers for range, formation, etc., and compares their die roll to the opponent's Defense Die roll. If the Combat die roll is higher, for every 3 pips of difference, the target loses a unit integrity. Infantry start with 4 Unit Integrity (UI), Cavalry 3, and Artillery only 2. When a unit reaches zero UI, it routs; if it reaches -1, it is removed from play entirely. Close Combat: A similar procedure is used to resolve Melee in Field of Battle, but this time only the opposing Combat Die types are used, and both sides modify their die type by a similarly short, straightforward table of modifiers. There are some special provisions for victorious Cavalry and defeated artillery. Morale: There are no “morale checks” in the traditional sense in Field of Battle (exception – the optional “Resolve” card, which I have yet to ever use in a game), but when combat inflicts damage upon a unit, and the Combat Die roll doing so is “Even”, the enemy generally suffers additional effects, ranging from going Out of Command (like “shaken”), retreating, or routing outright. This greatly speeds up play. At the same time, each army starts the game with a limited number of Morale Points, averaging about one per unit. Each time a unit takes hits, one Morale Point is surrendered for each Unit Integrity lost. When an army reaches zero Morale Points, it is subject to the Army Morale Card. If/when it is turned by an army with zero Morale Points, the army's Commander-in-Chief roll his Leadership die against a D12, and if the Commander testing loses the die roll, bad things will happen, ranging from one Command Group pulling back and going Out of Command, to the battle ending in a retreat by the entire army right then and there. Hofkreigsrat House Rules for FoB Napoleonics, 1st ed. As much as I enjoy Field of Battle, like most other Napoleonic wargamers, I have my own biases when it come to Napoleonic Warfare on the tabletop. The following are some very minor adjustments that I make to the game in order to more closely reflect my own tastes. Feel free to use some, none, or all of them in your own games. Infantry not in Square versus Cavalry: As a general rule, cavalry attacking infantry in good order frontally will usually be defeated, especially if the infantry is “loaded”. That is as it should be, but I feel that for the Napoleonic era, cavalry is still a bit weak when compared to the infantry. Therefore, we give infantry not in Square fighting Cavalry a Down 2 modifier. Other formation modifiers still apply, particularly the Up 1 for Infantry in Attack Column. 2nd edition note: the second edition has improved the average CD ratings for most Cavalry, and several other rules modifications that may change the effectiveness of Cavalry in the game, so this modifier may need to be re-examined for 2nd edition games! Foot Artillery Mobility: We allow Foot Artillery to perform one action per MOVE segment, regardless of whether the LD roll is even or odd, and in exactly the same fashion Horse Artillery can perform two actions per MOVE segment. The introduction of militarized drivers during the Napoleonic era greatly improved the mobility of field artillery when compared to, say, the 7 Years War. Artillery Combat Die Ratings: Considering the lack of bounce through fire, as well as the negative modifiers for Artillery in Melee (which includes last minute defense of Battery fire), we feel that artillery are a bit underpowered as per standard Field of Battle ratings. We therefore rate all Napoleonic artillery UP 1 for CD from the values listed in the main rules. 2nd edition note: The ratings for units have been altered so this may also need re-evaluation for 2nd edition games. Leader Casualties: We find the loss of leaders on a D12 roll of “1” to happen rather too frequently for our tastes; loss of leaders slows the game down considerably. Therefore, we roll a D20 for Leader casualties instead of a D12. Corps Command: Where present, Corps Commanders may re-roll any ONE Leadership die roll (even a “1”) of his subordinates (using his own LD type) on each MOVE or MOVE ONE COMMAND card; the new roll, even if worse, stands. This does not subject the Corps commander to a Survival Test. Leadership Die Rolls: Now only WINNING even LD rolls allow “fancy Business”, but all units may initiate melee on a winning Even LD roll, not just attack columns. Limbered Artillery: Similarly, artillery units that BEGIN the game (or enter the table as reinforcements) may unlimber at any time using a MOVE segment for the change; thereafter normal deployment rules apply. Skirmishers: ignore terrain penalties for Class II and II Terrain on an winning EVEN LD roll. Players with multiple command groups must choose which group to roll for first, then move that group. Then chose the next, and roll for an move that group, Then the next, and so forth. You may not roll for all your groups and then decide who to move and in what order! Leaders: Army Commanders may now ONLY move on a LEADERSHIP card, and only a single (16”)segment. Command group leaders move with their commands, and as many segments as their command rolls, as well as up to 16” on each LEADERSHIP card. The variability/overlap between ratings has been reduced somewhat – in other words, it is more likely that RAW and RABBLE units (D4 defense die types) will have CD's of 8, and less likely for them to have higher CD's than prior, and conversely fewer if any CRACK and ELITE units will have CD od 8, and more will have CD of D12+1 than in FoB1. Cavalry have moved up about a die type for CD on average, and Heavy Artillery have moved up somewhat on average, too. are unchanged, however a semantic change in Sequence deck quality is introduced, now ranging from Abysmal to Poor to Average to Skilled to Excellent (instead of Superior to Excellent). Sequence deck compositions are unchanged. Modifiers: a) The UP 1 for Initiating melee applies only on the first round if initiating melee on an Even LD die roll, but for all rounds when initiating on the MELEE card. b) The unit with a higher Defense Die Type gets an UP 1. c) Units that are Outnumbered (engaged by 2 enemy units) get a DOWN 1 modifier, plus there is a new procedure for resolving 2:1 melees. Results: Units that suffer 2 or more UI in a single round will ROUT; units that lose 2UI or more in a single round vs. Cavalry that rolled EVEN are destroyed. Routed units that are contacted by the enemy are destroyed outright, but no additional Morale Points are lost for this. New rules are added for Cavalry evading from melee against infantry and artillery, and Limbered Artillery and Skirmishers evading from melee. In all cases this occurs AFTER the first round of melee (if they survive without Routing). Squares in Melee: have a new procedure, but the cavalry vs infantry in square modifier is eliminated (I personally question if this was intentional or an oversight!) (Update 6/4/11 - Brent sent me the final drat, and the modifier is in there is a slightly different form.) Squares may only be engaged in melee on a Melee card, not on an Even winning LD roll. RALLYING: the procedure is unchanged, but modifiers have changed slightly; the test is now DOWN 2 for Routers at zero UI, but only Down 1 for Routers with 1 or more UI remaining. The TACTICAL ADVANTAGE Card also may now be used to modify the roll. New rules (harsher penalties) are imposed for armies whose C-in-C has been lost and not yet replaced. MELEE! CARD: This card now allows units within HALF a move segment of the enemy to move into contact with the enemy and resolve melee immediately. There are restrictions: Target must be in line of sight, move must be straight without change of facing (incline move is allowed), and no interpenetration of friendly units is allowed. Additionally, the ½ move to contact may NOT be used across rivers (and presumably streams), fords, or bridges. (I absolutely adore this change; we tested it in two games at Historicon 2010, and I liked it so much I've played with this rule ever since. It speeds up the game, and now the appearance of the MELEE card is often a big deal, as opposed to fairly ho-hum previously). TACTICAL ADVANTAGE CARD: May now be used to modify any ONE roll other than an Army Morale check/ (Question: does this include the LD vs LD roll for Initiative? ; one would think not but it appears to be allowed by the above). (I like this change, too - it puts a bit more usefulness in this otherwise fairly bland card). RANDOM SCENARIO GENERATION: FoB2 includes a system for this; I have no further information about this, but would note that Brent has already done scenario generation in great depth for Theater of War and also Command Piquet previously; I would expect the system to be similar to those, but I could be completely wrong there! So, there you have it. If you haven't already tried Field of Battle, I would urge you to do so. If you're already a fan of these rules, the second edition introduces many worthwhile refinements but little in the way of radical changes. As the first edition already works very well as written, I think that's a good thing! I've added a new scenario, with a detailed, annotated battle report illustrating the working of these rules in considerable detail: The First battle of Polotosk. Garry Barr has added 4 you tube videos of a walk through of a Seven Years War game using Filed of Battle, 2nd edition. In June 1809, the French under GD Broussier had a half-hearted siege of the city and fortress of Graz in Styria under way. The approach of a relief army from Croatia under FML Ignaz Gyulai, caused Broussier to abandon the siege. Marshal Marmont and the Army of Dalmatia then approached form the South on the opposite side of the Mur, and Broussier returned to the city and launched an attack, driving Gyulai back. Broussier then received orderes from Marmont to march South down the West side of the valley of the river Mur. He detached 2 battalions of the 84e Ligne to the East bank to "chase off the 150 Hussars and as many Croats" that the French believed were all that was left in the vicinity of Graz, plus 3 companies of Leger to hold the bridge at Gosting, North of the city. As it turned out, Gyulai was much closer to Graz than the French realized, setting the stage for this interesting engagement, which is detailed in John Gill's "1809: Thunder on the Danube, Volume III". As I've mentioned previously, if you have a strong interest in this campaign, you absolutely *must* have these wonderful books! Barry and I fought out this scenario last weekend, which is #18 in my Blunders on the Danube scenario book. Incidentally, I received confirmation that the book has been sent to the printer, and availability is anticipated for July, and with a revised second edition of Field of Battle itself. Barry graciously took command of the Austrians, whose force consists largely of second line troops and untried units of the newly raised Hungarian Insurrectio. If nothing else, the game presented the opportunity to field a number of recently painted units, including all of the Insurrectio, 8 French Ligne and 2 Legere. Wargamers know that for some reason, newly painted troops seldom perform well in their first appearance on the tabletop! We used the Field of Battle rules from Piquet, by Brent Oman, incorporating several of the rules changes from the 2nd edition. Broussier's Division at the start of the action, now counter marching back towards Graz from the South. Ignaz Gyulai and the Austrians; Splenyi's Division in the lead, with Kalnassy's Division behind them. Munkassy's Division is on the far side of the Mur, which is crossable only at the bridges, and (for the Austrians only) at the city of Graz. A closer view of the Austrian set up; this picture, one of several in this post taken by Barry with his camera, shows the color of my table covering in much more accurate hues than mine ever do! Note the blue coated infantry of the Hungarian Insurrectio. The fortified city of Graz, with the 84e Ligne's 2 battalions and a section 3# "pop guns", stationed at the St. Leonhard suburb on the far side of the river. All of the hills/mountains are impassable. Broussier advances towards Graz and the bridge at Gosting. The Austrians have their own advance going, and their 4th Division has now arrived on the East bank of the Mur, under Gavassini. Barry rolled very well for Gyulai, who came out rated an uncharacteristically Austrian D12 for his Leadership die; most of the Austrian sub commanders were more typical LD 8 ratings, however. Aided by hot Initiative rolls (Rolling his D12 against my D10, Barry never lost an initiative roll the entire game), the Austrians are advancing with unwonted alacrity! View of the Austrian advance from the French perspective! Overview of the battlefield at this point; the 84e are starting to get nervous as hordes of Asutrians start to appear near Graz! The French Initiative sees the early arrival of Marmont with Clausel's Division (this division could enter anywhere between the 1st and 6th French Move Card, with the 3rd probably being about the average result). I have left a limbered artillery battery in the lead of the advance... perhaps not the best choice, but there should be plenty of time to get it unlimbered and into action when the time comes, right? Umm, maybe not! Barry proceeded to win TEN impetus, and his lead Division's commander unit rolled "Three segments with Fancy Biz" when they turned a "MOVE ONE COMMAND" card. Oops! The command passes right through Graz and onto the West side of the valley. Close up of the Charge of the Austrian Hussars upon the limbered French Artillery. Even Insurrectio Hussars can probably win this one! The Legere unit behind them in March Column won't fare much better if they get charged by the aggressive Austrian Horse, either! As expected, the Austrian Cavalry sabers the crew and runs off the limber horses, at no cost to themselves. The Austrian Cavalry battery and supporting infantry are also in position to block the French advance! However, the Austrians have used their 10 impetus, and now the initiative passes to the French! Barring an untimely LULL card, the French will have a lot of actions before the Asutrians can make much adjustment. The Legere unit in the lead has used a MANEUVER card to deploy into line (as have most of the rest of the Division), and fire at the Hussars. The one UI loss they inflicted with their fire is indicated by the single rock marker. On a MOVE card, the Legere have pulled back and fresh French infantry move forward to blast the Hussars and avenge their comrades of the Artillery, while a French attack column charges a unit of Insurrectio. Overview of the Battlefield at this juncture. The Austrian Cavalry battery has fired and inflicted one UI loss on a French battalion in line, and forced it back, "Out of Command". Note the rock and the swine markers. Meanwhile, the unit of Insurrectio in line has defeated the French Column attack, the end result after exchanging fire and both units crossing bayonets being both down 1 UI and Out of Command (note the rocks and assorted fowl markers). With another French MOVE card, though, the combination of waves of fire from the units in line, and close attacks by columns upon the now unloaded artillery and Insurrectio, has shattered almost all of Spenyi's Division. Note all the "smoke" hovering over the battlefield! With Barry winning another chunk of impetus on the next Initiative roll, Munkassy's Division is threatening the flank of Brousier's Division; Clausel's Division (in overcoats) is positioned to mitigate the threat. A charge by one unit of Insurrectio succeeds in hitting a French battalion in the rear and routing it, but another is completely dispersed following and exchange of fire with two fresh French battalions. Two units of Grenz exchange fire with two units of French line; in the end the poor defense dice (D4) of the Grenz make the difference, and one of the units is routed. On their initiative, the French sweep away the rest of Munkassy's Division. The Austrians are out of Morale chips, while the French still have many remaining. The 84e appears safe, having yet to even need to fire a shot! The city of Graz is filled with the routed units of Splenyi's Division; only the unit of Insurrectio in the gateway is still in good order. With no chance remaining to destroy the isolated 84e Ligne, the Austrians concede and allow the regiment to escape unmolested. The French cannot dally to enjoy their success, as Marmont has just received a dispatch from the Emperor, calling upon him to march with all haste to the Danube, where his troops will participate in the Battle of Wagram in barely a week's time. Scenario notes: The French are significantly outnumbered, but the bulk of the Austrian troops are of poor quality, as are their leaders. The French are veterans and competently lead. The Austrian player has the option to detach 2 units of Grenz from Gavasini's Division to attempt a mountain track around the Ruckerlberg and onto the table behind St Leonard, as happened historically. It would probably have been better if the Austrians had been a bit less aggressive and sent Splenyi's Division ahead to block the bridge at Gosting, and used Kalnassy's Division, which has the best troops, to attack the 84e. Still, as it is said, no plan survives contact with the enemy! In any event, almost all of the newly painted troops got into the fight, and didn't do that badly for once. To start the turn a free die roll is made and comes up a “3”; Cavalry Actions. Von Karrion wins the Leadership roll off, but with a false tone of aristocracy, drawls out sonorously “You may go first, Gentlemen of France”. He hopes to get some clue as to Sorbet's plans by observing how he handles his cavalry. Committing 3 of their officer's 4 Leadership dice, one per unit, plus one resource die each, once the re-rolls are done, Sorbet's cavalry thunder across the Raubersfluss, moving 21”, 20”, and 20”! The initiative passes to Von Karrion who decides to stand pat with his Cuirassiers, hoping to rally the second unit later in the turn. He decides the Cavalry on his left flank have too little room to maneuver, but decides to try again to move his all important Horse Artillery across the river, declaring his intent to maneuver as well. He commits all of their officer's leadership dice to the attempt,and succeeds handily. Sorbet and Von Karrion roll off for the next phase, and both roll an eleven; this tied roll means that the next phase is skipped! Thus Phase 4, Infantry actions, is bypassed, and the roll off goes to Sorbet, rolling a 9 to Von Karrion's pathetic 7 (on four dice!). With his own attempt at savoir-faire, Sorbet announces, “This time, my dear sir, it is you of Austria who shall have the honor of the first move!” Sorbet has a scheme hatching ever so slowly in his his wine addled brain. Von Karrion sees little point in expending any dice on his artillery at this juncture, and passes the initiative to Sorbet. Sorbet makes free use of Leadership dice to limber up his far right hand battery, move it forward just beyond Raubersdorf, and turn it to face across the river, threatening the Austrian flank. In so doing, though, the battery will be vulnerable, as they are still limbered. This is the Rally, Restore, and Sorbet wins the roll of this time, and continuing the veneer of false nobility, tells Von Karrion, “But of course, our valiant enemy, you must have the pleasure of acting first!” Von Karrion uses all 4 of the Leadership dice of the Cuirassiers' officer and a single resource die, plus 2 free dice and this time succeeds in rallying the second Cuirassier regiment Both also restore all their officers to their full quota of leadership dice. There are no unloaded units. Phase 1 (Special actions) being irrelevant, the play moves to phase 2 (Officer Actions). Von Karrion wins the roll and once again turns the initiative over to his opponent, it making little difference who acts first in this circumstance. Sorbet thereupon repositions his officers, none having less than sufficient movement rolled on their 4 d6's, and Von Karrion does the same. Almost as quickly as it started, Turn Three is over! The free die roll to start the turn comes up “1”, Special Actions. In a twist of the Dice-Deities a bit too suitable to be chance alone, The French and Austrian rolls are tied, thus skipping this essentially useless phase! Von Karrion wins the toss for phase 2, but has no need to reposition any officers, while Sorbet makes use of some additional movement to catch his officers up to their troops on the French Left flank. Von Karrion then wins the roll-off for phase 3 (Cavalry actions), and having little he wishes to do, hands off the initiative once again to Sorbet. The French Cavalry brigade announces its intent to maneuver, and with the assistance of some Leadership dice, it moves towards the far edge of the table and starts to turn to face the Austrian Cuirassiers. Von Karrion waves his gloves dismissively, declining the opportunity to act with his own horsemen. The key initiative roll for Phase 4 (Infantry actions comes, and Von Karrion just manages to come up with a winning roll. “I shall take what Fate has offered here, Prince” he chortles, as he starts moving his Infantry again at last! Starting from his left and proceeding to his right, Von Karrion moves the Infantry of his Advanced Guard forwards; unable to benefit from even their Poor Command, the Mass Column proceeds only 9”; still, it is enough to create maneuvering room for the Austrian light cavalry at last. One of the central mass columns moves half of the formation forwards, and deploys the other half into line. Karrion's ears. His countenance brightens further, as he asks, “Aren't you forgetting something, my good man?” “I rather doubt it” replies Sorbet tartly. “Well, I have taken the second level of the heights; be a sport and toss another 10 dice into the bin, eh?”. Sorbet counts out the dice rather more slowly than necessary, and allows them to trickle from his hands to join their many fellows. The outflanked Light Infantry mass column is the first French priority; their Commander has already used all his leadership dice in bolstering the morale of his troops, but as they are Elite Light Infantry in Column Mass they still get three free dice. “I'm sure you will find it shocking that I intend to maneuver with these fine fellows, Von Karrion” he announces. The die rolls are sufficient for them to turn 90 degrees and move to close range. As the Austrians opposite them have fired markers on them, they cannot shoot. The second Light Infantry brigade, with the support of three of it's officer's five dice, likewise announces its intent to maneuver and move. Although it costs 12” of movement to maneuver 90 degrees, their movement is still sufficient to bring them to within close range of the remaining Austrians on the Raubergrube heights. Sorbet has retained 2 Leadership dice of General Camembert, having anticipated this situation. However, the fast moving light infantry have outpaced their leader by quite a distance, and one of his two attempts to transfer a Leadership die to each fails, even with 5 dice to roll, while the other succeeds. In the event, benefiting from re-rolls for first fire and higher ground, the un-bolstered unit is bested by 5. As Camembert is a Fabian commander, they MUST retreat the difference (5”), BUT they remain in good order at no additional resource die cost. The second Austrian unit fails to better the score of its French opponent, bolstered as it is by the passed yellow Leadership die. Both Austrian units are marked with puffs of smoke. Sorbet then shoots with the three Legere units at close range. The left hand unit has dice as hot as butter sauteing shallots, and rolls a score of 15, whilst its Austrian target rolls only 7 with three dice, even after re-rolling its lowest die. The Austrian unit must fall back 8” in Disorder (retreats over 6” present no option to exchange dice for retreating). The second Austrian unit outscores its French opponent, and so there is no effect. The final unit of French Legere, benefiting from its more carefully loaded First Fire, outscores its target by 5. With the Reload phase coming up soon, Von Karrion chooses to pay the 5 extra resource dice and have the unit stand in Good order. All firers and targets have rolled 2 Resource dice apiece. In the center, Sorbet has a single unit in line, augmented by many Leadership dice, move forwards and change facing, thus supporting the still limbered light battery alongside Raubersdorf. The remaining units of the center seem well placed, and thus Sorbet decides against using any dice for minor repositioning. On the French Right, Sorbet moves his Division in Column Mass forward, beyond the plowed field, and into close range of the Austrian Advanced guard. One unit of the other division on the right moves into the second house of Raubersdorf, while the other two units, augmented by Leadership dice, move forwards in support, halting at the edge of the plough. This time, Von Karrion remains silent in the face of the French advance. “I say, my dear chap, I fancy some shots at your advance guard with my Line infantry in Column Mass”, Sorbet remarks causally. “Oh you do, eh? Well I bloody well will fire at your lads as they close.” blusters Von Karrion in response. The four French and Austrian units exchange simultaneous fire, and there is much clattering of dice being rolled and re-rolled again; in each case the respective generals chose to roll 2 red resource dice on defense and shooting; Sorbet had held back 2 Leadership dice and is successful in transferring one to each of two of the closest units of the Division. When the extensive smoke settles, Sorbet's fire failed to impact 3 units, but the 4th was bested by 7, and must retreat 7” in Disorder. Similarly, Von Karrion only manages to inflict losses on one French unit, and that by only 2 pips. Sorbet chooses to pay the two extra resource dice and stand his ground in good order with that unit. “Cursed lot of damp powder my Croats must have,” bellows Von Karrion. “Be a good man and handle over another 10 resource dice, if you please?” asks Sorbet sweetly. This is the glace on his meringue. “Huh? Oh, yes I see, you have claimed another building of Raubersdorf this phase. Well, I suppose turnabout is fair play, and all that rot!” Difficult as it is to believe, the longest phase of the battle thus far is completed. Von Karrion wins the toss, and acts first in the Artillery Actions phase. He decides that his troops need artillery support, and adding 3 of his personal Leadership dice to the attempt, has the far right had 6lber battery limber and move forward. Deducting the 6” to limber, the move is only 5”. On the Austrian Left, the Cavalry Commander of the advanced guard contributes all three of his leadership dice, and that plus 1 red die and 2 green dice rolls up as 23, enough to move the battery 11”, change facing, and unlimber. With the Reload phase coming up, Von Karrion elects to fire. On measurement, the range is just over 7” to the nearest French unit, so it is long range, awarding the target an extra free die, while the artillery gets a free die for shooting at a column. Von Karrion rolls that plus 2 red dice 5, 6, 2; as it is his first fire, he can re-roll the 2 and it comes up a 4; fifteen in total! “Put that in your snuff box and sniff it, Prince. Smells like Black Powder to me!” Sorbet's smile melts as he tosses 6,1,1! Fortunately, he can re-roll the multiple, and he comes up with a 6 and a 2, for a total of 14; he pays the extra resource die to stand in good order. The initiative passes to Sorbet. He desperately needs to unlimber his Foot battery alongside Raubersdorf, and so he uses a red die plus 2 green dice (for limbered artillery, and easily scores above the 6 needed to unlimber; given the situation around the battery, it barely inches forward before unlimbering. He also decides to limber up his horse battery with the assistance of 2 free dice from the artillery commander. Van Karrion has used 1 of his Leadership dice thus far, while Sorbet has used them all; Von Karrion easily wins the initiative for this critical Rally, Reload, and Restore phase. “Sorry, old bean, but I am most assuredly going to carpe the diem, as it were!” He reloads all of his infantry and the horse battery, and then fires all but the two Disordered units! Sorbet wilts like lettuce in the sun on a summer's day. Over on the Raubersgrube, the three Austrian infantry units fire at the French to their front. With the advantage of the heights, 2 units score 6 hits each on their targets, and the other unit misses. One of the target units is commanded by the Fabian Camembert, so it must retreat 6” but remain in Good Order at no additional cost. Sorbet grimly pays the extra six dice for his other unit to remain in position in Good Order. On the Austrian Left flank, the Horse artillery misses, and so does one of the Infantry units, but the other two beat their French targets by two and six pips respectively. Sorbet feels his face flush as he pays the extra 8 dice to stand, and whines, “Are you quite DONE, my good fellow?” Von Karrion, rather pleased with his tactical brilliance, declares, “Just let me restore my Leadership dice, and attempt my rallies, and it will be your go!” The Disordered unit on the Raubersgrube is too far from its commander to benefit from Leadership dice, and Von Karrion decides not to even make the attempt. He does attempt to rally the Grenz unit that was forced back on the far flank, failing miserably, the Poor Leader being too far to offer support. Sorbet opts to reload his 3 Light Infantry units on his left, but opts not to fire them at this time. He removes the fired marker from the Light Artillery battery that unlimbered but again chooses to hold his fire, figuring it may discourage excessive adventuring on the part of Von Karrion. He reloads his 4 Line Infantry units in Column Mass, and shoot with one of them, scoring a perfect 18 with 3 dice! Even with a re-roll, the target can manage no better than a 7, and are forced back 11”, almost to the table edge, in Disorder. The wily Frenchman decides to hold fire with his other three units. He has no units requiring Rallying, and thus Restores all of his officers to their full quota of Leadership dice. Turn Four is over! What? Oh yes; sorry, really excellent vintage you have here, by the way! Well, this turn nicely indicates how rapidly firefights can consume Resource dice, and yet often without decisive results. Still, Sorbet and his French seem to be slowly gaining the upper hand. We shall see if Von Karrion can generate some momentum of his own. I do wonder why Sorbet hasn't attempted to at least seize control of his side of the bridge, don't you?" Turn Five, Phases 6, 1, and 2: Austrian and French Initiatives. D6 roll is 6, Rally, Reload and Restore again. Oops, this could cause discussion about who can fire when with what modifiers! In the event, Sorbet and Von Karrion both roll a 14, and so the phase is instead skipped entirely. The pointless Phase 1 (Special actions is then skipped by mutual consent. Phase 2 (officer actions follows), and Von Karrion wins the roll. He repositions his officers, and the Sorbet does the same for his – very important as many had fallen well behind their troops. Von Karrion wins this phase, Cavalry actions, but sings out “My dear Prince, if you would be so kind to act first, I would be ever so much obliged!” Sorbet, using a single red die and one Leadership die added to the 2 green dice for being in column of route (limbered), rolls 17, and moves his Horse artillery battery forwards 11” and unlimbered. In so doing, it passes within long range of an Austrian Light Battery. Von Karrion cannot resist firing, but even with a re-roll and using 2 red dice, he can score no more than 5! Sorbet disdainfully add a leadership die to a single red resource die, easily exceeding the battery's roll. He then carefully adjusts the positions of his light cavalry brigade, careful to use NO Leadership dice, and to keep them a long distance from from the Austrian Cuirassiers and yet situated to guard the flanks of his infantry. The Hussar unit lags behind, acting as a reserve. Von Karrion then acts. The French artillery are making a crossing of the Raubersfluss with the Light cavalry of his Advanced guard look altogether too hazardous. He decides the unloaded horse battery is looking terribly vulnerable, and decides to limber and withdraw it. He debates long and hard whether to charge the French Light cavalry, and despite the distance and the probability of taking fire from the Light infantry as the heavies round the Raubersgrube, he simply cannot resist the allure of the Grand Charge. Figuring that the Cuirassiers will be too far away to add Leadership dice in the melee anyway, he allocates to LD to each unit. With the extra dice for Heavy Cavalry, Attack Column, and an Headstrong general, each unit will roll one red, two yellow, and three green dice for movement! Despite six dice, the first unit only manages to score 19; as it turns out, the French Cavalry is just under 20” away, so the charge would fall short. As their officer is Headstrong, they MUST move the full distance. As they do so, however, they come within range of the Leger, who are loaded, and fire. They commit two red dice and with two green free dice, roll a total of 11; the Cuirassiers can only manage a miserable 3 with two dice (Allegre had committed all his Leadership dice to movement for the charge). The first Cuirassier regiment must withdraw 8” in Disorder. The second Regiment, however, rolls 26” of movement, more than enough to charge home on the opposing French Chevau-Leger Lancier regiment. With two extra dice for Charging and being Heavy Cavalry, plus a re-roll for being in attack column, as opposed to one free die for being a defender in column, the Cuirassiers outscore the Lancers by 9; the lancers withdraw 9” in Disorder (nearly to the edge of the table), and Sorbet tosses another 9 red dice into the discard bin. “Good Heavens, Sorbet, I have forced a retreat from melee of more than 6” and may choose to pursue!” If he can contact the now Disordered Lancers, it will be an almost certain victory, which will force then off the table and award an additional bonus of resource dice equal to the units starting value, in this case 10 dice for a Line unit. On the other hand, if he fails to contact them, the Cuirassiers will themselves fall into disorder. In any event, they will be blown after this phase until rallied. Blown cavalry do not benefit from any free dice. In the Napoleonic era, a pursuing unit receives 2 free dice. It is a bit of a long shot, but if he succeeds, the rewards will be great, so Von Karrion decides to chance it. He rolls a 6.... and a 2; 8”. “Short by a miserable inch, by jingo!” laments the General. The Cuirassiers move forwards 8 more inches, and fall into Disorder... so close, and yet so far! Von Karrion wins the roll, and opts to act first in this Infantry Actions phase. . He feels reluctant to move most of his infantry but decides to withdraw his outnumbered Advanced Guard somewhat. As he announces his intent to do so, Sorbet declares his intent to fire upon them before they can do so, first with two of his artillery batteries, and then, if they remain in position, his infantry. He fires the Horse Artillery first; as they are rated elite, they get an extra free die for that, plus an extra free die for shooting at a column; the target can re-roll its lowest die as it is under fire from long range for the first time from that battery. In the event, the result is a difference of 11! The Hungarians must withdraw 11” in Disorder! This leaves the Light Battery without a target in their field of fire, so they decide not to shoot. Two loaded French Line shoot at the remaining Hungarian Line, beating it by 5 and by 3. Von Karrion pays the extra dice to maintain good order, and then uses a single red resource die, with a free die for column to withdraw in good order. Sorbet, smelling blood, eagerly directs the attack by his 6th Division on the far French right. He does not make any charge declarations, but uses a Leadership die to ensure one of the units is able to contact a disordered Grenz unit, and then plans to add the remaining Leadership dice of their officer to the attack by another unit. The remaining two columns move forward but are unable to contact the enemy, being left without any Leadership dice to augment their move. The Disordered Grenz actually manage to win their melee by 3, but the 2 Leadership dice added to the assault on the only remaining Hungarian unit in Good order results in a French victory by six pips; in each cases the generals cannot choose to pay the dice to remain in Good Order when losing a melee, but MUST retreat the full distance in Disorder. Sorbet then uses Leadership dice to augment the moves of 3 Line Regiments of his 5th Division moving up in support of the 6th; no combat is possible involving these units. Sorbet chooses to conserve resource dice and not move any of the units of the 2nd or 3rd Infantry Divisions. He does, however, move up the two loaded Legere units into contact with the Raubersgrube, and they plus the remaining loaded Legere fire upon the Austrians on the heights; as the targets all have Fired markers, they cannot reply. Two of them outscore their targets by one and 3 pips respectively; Von Karrion pays the extra 4 dice for them to stand in Good Order. “I see”, replies Sorbet. “Well, the fortunes of war are never certain, but I confess your lads on the far side of the Raub look all but rolled up, and their destruction should bring about exhaustion of your resource dice. In order to avert any further needless blood shed, I accept!” The battle on the Raubersfluss is over! The game actually played much, much faster than it seems reading the account; indeed, writing this narrative took many times as long as the game itself. The game was fun, and once the game's mechanisms were mastered, fast moving as well. The limited resource dice mean that the players really must be careful not to fritter them away on actions that are unlikely to influence the final outcome of the battle. When units retreat in Disorder, they are vulnerable, but if they are not engaged as quickly as possible, they will often rally and return to the battle once again; on the other hand, forcing units from the table conveys a double bonus, both by eliminating their capacity to damage the opponent, and the additional resource dice lost. Leadership is key; a side with more and better Leaders, especially in the critical sectors, has a big leg up on its opponent... provided the Leadership dice are used wisely. The various special attributes of Leaders (Poor, Foolhardy, Fabian, Skilled, Headstrong, etc) adds character to the game, but it can sometimes be hard to figure out the final impact if the C-in-C and Sub-commander of a unit have differing special attributes. This battle used the simplest of many options for sequencing the events within a turn of Die Fighting. There are several others suggested in the rules, and both players may even be using different methods and executing different phases from one another! Choosing different sequencing methods can illustrate the advantages (or lack thereof) pertaining to overall army efficiency and initiative on the battlefield. Finally, the rules book would definitely benefit from more examples of play to assist the new player in coming to grips with the rules; this report itself is an attempt to provide some such.. On the other hand, Bob is very active on the Repique Rules mailing list and answers questions promptly, often within hours. The Repique Rules mailing list also has a FAQ and errata for the rules, which is updated as issues arrive. There are adaptions of the rules planned for other eras, and of the greatest interest to me, a Campaign system, “Die Marching”, is planned for later this year.